Crop workers assist with the growing and harvesting of fruit, vegetables and other produce on farms, market gardens, orchards and vineyards. Source: Horticulture NZ and Pick NZ, 2018. Chances of getting a job as a crop worker are good due to a shortage of workers. Pay for crop workers varies depending on what they do and where they work. New crop workers usually start on the minimum wage. Crop workers with two to three years' experience may earn between $18 and $20 an hour. Crop workers who supervise others usually earn between $20 to $25 an hour. Fruit and vegetable pickers may be paid by how much they pick. Sources: Horticulture New Zealand and Pick NZ, 2018.
assist with general maintenance of buildings, fences and other structures. assessing fruit or vegetables for ripeness, damage, or size. may have to travel to follow seasonal work. Hugh: I’m Hugh Morrissey-Brown, I go to St Peter’s College. I’m here at NZ Hothouse to see how tomatoes and other vegetables are grown on a large scale. Clinton: Well, Hugh's come to New Zealand Hothouse, just south of Auckland, to learn about the job of a vegetable grower. The hothouse is one of the biggest glasshouse producers in the southern hemisphere and one of the most technically advanced in the world. Jason: Hi Hugh, My name's Jason. I’m from NZ Hothouse, welcome. Well you won’t need your jersey; she’s pretty hot in these greenhouses. Come with me, let’s go. Clinton: Head grower Jason Culbert is on hand to show Hugh that there’s much more to a career in today’s vegetable production industry than simply harvesting the crop. Hugh: How many plant are grown in one section? Jason: In one of these units alone we can growing up to 50,000 plants and we have seven sections on this property so we’re growing well over 200,000 plants just on this site alone. Clinton: With such intensive cultivation on the site, the technology involved in keeping production up is immense. First lesson to learn, the plants are hydroponic – there’s no soil. The tomatoes grow in precisely measured nutrient rich water. But the technology’s for later. First, it starts with the basics. Jason: When we’re picking tomatoes we pick to a certain colour. With this particular variety we’re just picking to what we call “half colour”, so it’s not too green and not too red, so we leave those ones there, that’s just too hard. Clinton: Everybody starting out in this industry has to begin with getting their fingers green in the hothouse. Jason: Alright Hugh, so the next job we’re going to do today is de-leafing, and the reason why we de-leaf – as the plants grow and they’ve dropped down we need to take leaves of so we can see the tomatoes for picking, and we just snap the leaves off and we just simply remove two leaves per plant. Jason: Alright, Hugh, there’s 360 plants in this row so I’ll leave you this row and I’ll go and have my smoko break, cheers! Jason: The exciting thing about this job is you get up every day and come to work and you actually enjoy what you're doing. A lot of people out there don't enjoy their jobs, whereas I really enjoy this job, and get a kick out of it. I feel like I'm only still a child in this industry. It's such a lifelong career, you're continually learning and that's what keeps you going at the end of the day. Jason: Before we can get on these trolleys to do our next task, we’ve got to do some trolley training. Clinton: There’s safety to read about, and buttons for forwards, reverse, an accelerator foot-pedal and up and down. Clinton: There’s three jobs to be done now they’re up in the air. Jason: This is a job that is done as you gain more experience – it’s called twisting and layering. We twist the string around the plant and then we layer the plant. So we just grab the bobbin, release it and drop it down. So you can imagine the plants are layered down the row because they grow about that much a week, about 25-30cm, depending on the week. Clinton: The vine can grow up to 20 metres long and the stem is coiled around the bottom. Once a year the old plant is discarded and a new one grown. Jason: The other job that we do as well – we’re going to put truss clips on our trusses and then we’re going to prune each truss to a certain number of fruit, alright? Jason: Grab a truss like this and then clip it on. OK, once we’ve done that, then we can prune the truss, ok? So for tomatoes in this house, we’re pruning to five. This truss has six fruit, so we remove one flower off the end of that truss. The importance of doing this is uniformity, so what happens if we didn’t put a clip on then the trusses can kink and we get many different sizes of tomatoes. So we want everything the same. Jason: Alright Hugh, away you go! Jason: Horticulture tends to be high risk because losing a crop is something we don’t want to have happen but in these modern greenhouse we have quite good controls with the computer systems and with the experience so with the high tech operations we are able to achieve high production. Clinton: The entire complex reacts to the weather outside. Vents in the roof open and close, the huge boilers provide warmth when it’s cool, carbon dioxide created by combustion is spread around doubling what’s normal. This promotes plant growth. Jason: This basically is the heart of the operation. This is where we can see everything and control everything in the greenhouse, alright? So what you can see here is we can see that we’ve got environmental data for each compartment and also irrigation data for each compartment. So we can see exactly what's happening in every module. We also have the ability to see as graphs excatly what's happening. Clinton: With such a wide range of science involved comprehensive training is essential. Horticulture training adviser Louise Cooper is here to assess assistant grower Bobby Nijjar. Louise: The advice I would give to anyone who is looking at entering the vegetable production industry is to get out there and take your CV around to try to get and after school job, talk to the people that are already in the industry about what the job involves – really just getting in there and giving it a go and getting hands-on. Hugh:So what do you enjoy about your job? Bobby: This is the best spot that I've ever found working since I've been in New Zealand. Clinton: Today Bobby’s keeping Hugh busy with bee distribution. Hugh: So there are bees in here? Bobby: Yes, there are bees in here. Clinton: Using bumblebees to pollinate produces rounder, more consistent fruit. Clinton: When the bees are working the hothouse can’t spray – insecticides will kill them. So they’ve had to look for natural methods of pest control. Jason: The challenges of growing is pests and disease. That’s a big challenge and in this company we’re working towards getting away from spraying so when we do spray we use things like soaps, we use sticky traps on trolleys, we do a lot of scouting so that’s the name of the game, that’s my personal objective is to not spray the tomatoes. Clinton: To reduce the problem of whitefly, parasitic wasps have been introduced. They inject their eggs into the larvae of whitefly, which kills them. Clinton: Unwanted bugs could cause whole shipments of export fruit to be rejected, so in the packhouse, checking for unwanted pests is an important part of quality controller Jamie Anderson’s job. Clinton: This $1.5 million packhouse grading machine is state-of-art. Each piece of fruit is photographed, very accurately measured, and colour-tested too. The data is fed to a computer which chooses a bin for a particular colour and size. Brett: If you get stuck in the past and you just kept doing things the way you did them yesterday, I think you’ll get left behind because with technology, things are just motoring along. Brett: I think what we’d like to see in this industry is young people coming in who are innovative, up to speed with technology, can take technology on. Older guys like me, we've been dragged along with the technology but I love to see some of the younger people coming along and they're just already up to speed with computers, and they're saying "Look, have you thought of doing this or doing that", or we can add some value, we can do Facebook, so we need people with those sort of talents that can bring that to the business. Clinton: So it’s been pretty full-on for Hugh, how’s he done? Jason: He did really well, he picked it up pretty quick – particularly with the clipping which is quite a hard job to master and we need those sort of people in this operation. Hugh: Some of the interesting stuff I learnt about this place is how much it actually takes to run this, like the amount of people and the amount of technology that is used and the amount of effort that's put in just to grow tomatoes is phenomenal. Clinton: There’s a shortage of school leavers entering the vegetable industry so the job opportunity is there. You have to start with basics, but with training and some technical ability, career progression is excellent. Horticulture is an important part of the New Zealand economy and the demand for quality food continues to grow. There are no specific requirements to become a crop worker. However, horticultural knowledge or experience is useful. Some employers support crop workers to gain horticulture qualifications on the job. There are no specific secondary education requirements to become a crop worker. However, agriculture and horticulture and biology are useful. Year 11-12 students can learn more about the horticulture industry and earn unit standards towards a National Certificate in Agriculture, or Horticulture (Level 1 or 2) with the Trades Academy. Year 12-13 students can learn more about the horticulture industry and earn NCEA unit standards through the Primary ITO Gateway programme. sports or other outdoor activities. Crop workers need to be reasonably fit, with strong arms and backs, as they may have to do long periods of physical work. They should not have any allergies to plants, pollen, chemicals or fertilisers. increased exports, with a 40% rise in export earnings since 2014. To manage the shortage of horticulture workers the industry is creating up to 300 permanent job positions a year and recruiting temporary workers from the South Pacific. According to Horticulture New Zealand, there are around 50,000 people working in the industry. Demand for crop workers is higher during the peak growing seasons of summer and autumn. Your best chance of getting work is to contact employers directly. The best regions to find work are the Bay of Plenty, Tasman (Blenheim, Nelson and Motueka) and Hawke's Bay. Chapman, M, 'Access to Labour Critical to Horticulture's Growth', 16 March 2018, (www.hortnz.co.nz). Galloway, J, 'Visas Loosened to Resolve Fruit-Picking Crisis), 16 March 2018, (www.stuff.co.nz). Horticulture New Zealand, 'Horticulture NZ Annual Report 2017', 2017, (www.hortnz.co.nz). Ministry of Social Development, 'Declaration of Seasonal Hawke's Bay Labour Shortage', 12 March 2018, (www.msd.govt.nz). Primary Industry Training Organisation, 'Find a Great Career', accessed May 2018, (www.primaryito.ac.nz). 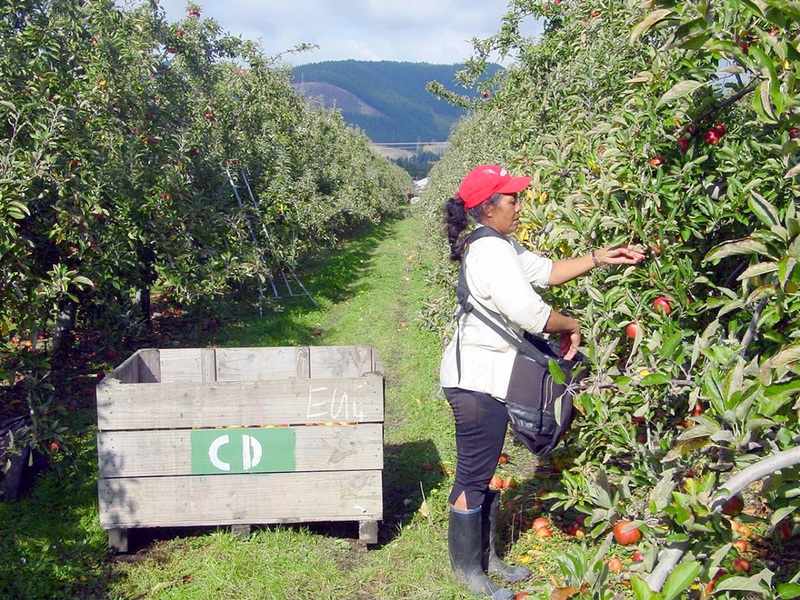 Radio New Zealand, 'Slim Pickings: Worker Shortage Leaves Apple Farms Frantic', 1 March 2018', (www.radionz.co.nz). Stats NZ, 'Regional Seasonal Employment Employers Survey 2017', September 2017, (www.stats.govt.nz). Van Beek, J, national seasonal labour, Horticulture New Zealand, careers.govt.nz interview, April 2018. Crop workers may progress to become team leaders, shift supervisors or managers. Crop monitors check plants and trees for any pests and diseases and follow up on treatments. Harvest quality controllers take samples of fruit before and just after they are harvested to check their size, colour and quality. Hydralada operators use and maintain machinery to pick fruit off the tops of trees. Pruners cut the branches of trees to improve a tree's growth and health. Thinners remove fruit from a tree that is of poor quality or not a standard size to improve the growth of other fruit. Vineyard workers help grow and pick grapes for wine production. Arborists plant and remove trees, prune branches and treat disease. Gardeners plant and maintain lawns, trees, shrubs and flowers in public or private gardens and parks. Nursery growers/workers grow young plants, flowers, trees and shrubs for sale or for use in parks and gardens.